Lovers who are not just star-crossed but who cross a star king. A teenage lesbian witch and an evil priest. These are some of the larger-than-life characters who inhabit two new operas written by young composers from Wilfrid Laurier University. Both short operas will be produced for the inaugural Canadian Opera Fest, June 22 and 23 in Waterloo and Cambridge. 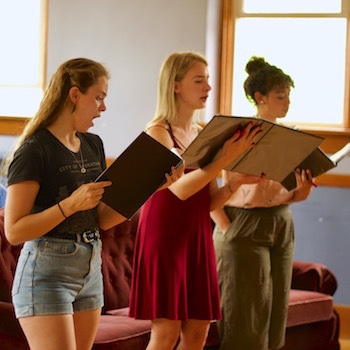 The operas, Padajuća Zvijezda, by Julijana Hajdinjak, and The Covenant, by Dylann Miller, will be produced and performed by Vera Causa Opera, an emerging Waterloo-based opera company founded by Laurier graduate Dylan Langan (BMus ’17) in 2015, when he was a student. Hajdinjak, who finished her Bachelor of Music in composition in April, wrote Padajuća Zvijezda, whose English title is Why Do Stars Fall? Sung in Croatian and English, her 55-minute opera begins in a beautiful, orderly celestial kingdom where love has been outlawed. The inspiration for the opera came from a short story Hajdinjak’s younger sister Danijela – who is starting the Community Music program at Laurier in September – wrote when she was in her early teens. In the celestial kingdom, where people speak Croatian, utopia is maintained by not allowing illogical emotions such as love. When the king’s daughter falls in love, she and her lover are banished to a dystopian, English-speaking Earth. “However, as the story evolves, we see that Earth actually has a different kind of beauty,” says Hajdinjak. Hajdinjak composed the opera, her first, for her final-year major project. She co-wrote the bilingual libretto with her sister Danijela, then composed the music under the mentorship of Assistant Professor Linda Catlin Smith. 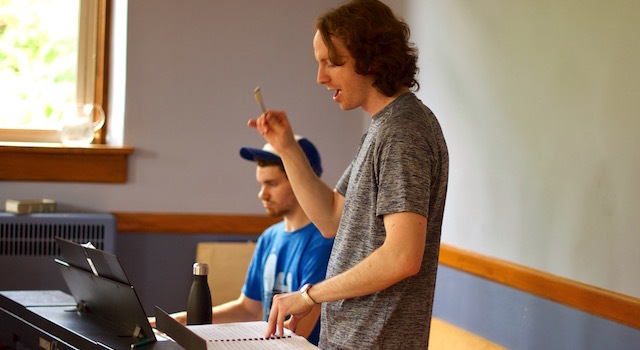 Though Langan is musically directing the opera (pictured above in rehearsal with Ethan Kelly accompanying), Hajdinjak had a hand in selecting the cast and is attending some of the rehearsals to help ensure her artistic vision is realized. Miller, who is taking her last few courses this summer to wrap up her Bachelor of Music in composition, wrote The Covenant in part to better represent young queer women in classical music. The idea stemmed from a conversation with her friend Midori Marsh (BMus ’17). Both Miller and Marsh identify as queer and felt there was a shortage of roles representing queer women as well as a general shortage of women composers. The Covenant centres on a teenage girl in a small, conservative town who is realizing she’s in love with her best friend, another girl. When she witnesses a sexual assault, she is so angry that she makes the perpetrator stab himself. This is how she discovers she’s a witch. Marsh led the writing of the libretto, to which Miller also contributed, and Miller wrote all the music for the hour-long opera. Like Hajdinjak, Miller was mentored by Catlin Smith and used the opera as her major graduation project. Isaac Page, who completed his Laurier music studies in April, is conducting. Miller, who is a singer as well as composer, warns there are disturbing scenes in her opera. However, it also contains funny and tender moments. “I think it’s something people who aren’t typically interested in opera will come see and be able to enjoy,” says Miller. The young opera company also exists to fill two broader gaps. One is local – Vera Causa is the only opera company currently operating in Waterloo Region. The other is national. Though there are small-scale operatic endeavours – typically just piano and voice – across the country, and some big-budget productions in big cities, there’s not much in the middle, says Langan. In addition to the crucial offstage roles of Hajdinjak, Miller, Langan, Page and Marsh, some of the Canadian Opera Fest cast members, including Mike Fan, Chad Quigley, Sam Rowlandson-O'Hara and Autumn Wascher, are Laurier students or recent grads. The Vera Causa Opera Orchestra also includes a number of Laurier students and alumni. The performances in June will be the first of what Langan hopes will be a long run of Canadian Opera Fests. Vera Causa Opera is now considering some 35 proposals from across the country and plans to produce two new operas for the festival next year. That’s in addition to three other operas being planned for the 2018/19 season. The 2018 Canadian Opera Fest is on at Knox Presbyterian Church, Waterloo, on June 22 and at Cambridge Centre for the Arts on June 23. Both evenings begin at 7 p.m., with an intermission between operas. Tickets are available through the Vera Causa Opera website. Langan hopes that in addition to the high quality of the productions, the affordable tickets and the relaxed dress code will induce some to go see opera for the first time.